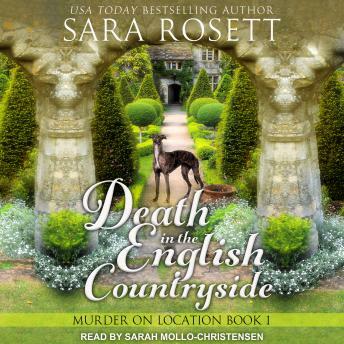 Listen to "Death in the English Countryside" on your iOS and Android device. Location scout and Jane Austen aficionado, Kate Sharp, is thrilled when the company she works for lands the job of finding locations for a new film adaptation of Pride and Prejudice, but then her boss, Kevin, fails to return from a scouting trip to England. Kate travels to England to salvage Kevin's and the company's reputation before word gets out that he is missing. Things go from bad to worse when Kate arrives in Nether Woodsmoor, a quaint village of golden stone cottages and rolling green hills, only to find no trace of Kevin except his abandoned luggage. Even the rumpled, easygoing local scout they consulted, Alex, doesn't know where Kevin might be. Increasingly worried about Kevin and with an antsy director waiting for updates about the preproduction details, Kate embarks on a search that includes a pub-crawl and cozy cottages as well as stately country manors. But Kevin remains missing, and she begins to suspect that the picturesque village and beautiful countryside may not be as idyllic as they seem.